Arsenal manager Arsene Wenger has confirmed that Theo Walcott underwent surgery on his damaged knee, Walcott went under the knife after injuring his knee during the Gunners’ FA Cup third-round win against Tottenham earlier this month. While The Frenchman remains positive of him making a full recovery, he also reiterated that the forward would not recover in time to feature in England’s World Cup plans this summer. 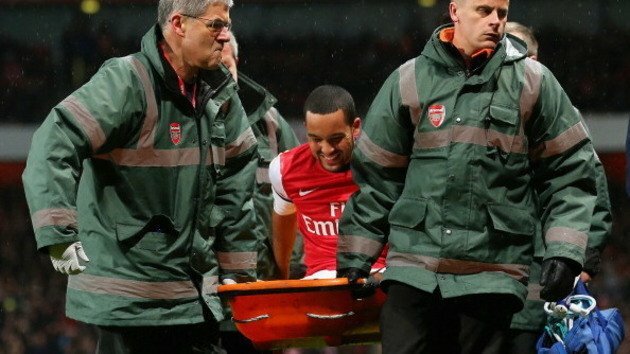 While Theo had been ruled out for the rest of the season, there was talk that Walcott could potentially return for the 2014 World Cup in Brazil. Arsenal will be taking on Fulham this Saturday as they look to maintain their title challenge and keep their 1st place league position. Arsenal has been hit with more injury woes, Monreal and Tomas Rosicky could miss the Emirates Stadium clash after they were both forced off with injuries in the win at Aston Villa on Monday. Wenger also went on to add that he has some updates regarding players working their way back to fitness.